If you’re completely unfamiliar with Alexa it’s really quite simple from a both layperson’s and technical perspective. Alexa is the voice platform behind the Amazon Echo, Dot and other Amazon speech devices. Regardless of the Amazon device you’re interacting with via speech, it all goes through the “Alexa” platform (as far as I know). From a developer’s perspective building Alexa apps is really really easy. Alexa apps send json to a given endpoint and expect valid Alexa json in response. That’s it. Of course, there are many nuances and details to understand, but from a high level this is it…json in and json out. I see absolutely zero advantages to deploying an Alexa application (officially known as “Alexa Skills”) on your own https server. There are many things you’ll need to worry about…ssl certs, scaling, high availability, monitoring…etc. Basically, all of the things any good SAAS application developer would worry about when deploying a new system. Due to the seamless integration with Lambda, it’s going to be the right decision 99% of the time when building Alexa Skills. The only way I would suggest running your own server to back Alexa Skills is if your application code had some pretty heavy dependencies such as numpy or another big and heavy requirement which couldn’t fit inside a Lambda function. Since Lambda support Python and Node out of the box, those will likely be your two choices for implementation languages/ecosystems. If you’re a real masochist you can run Java on Lambda. C# was recently released as a supported language as well. During our client engagement we would up authoring an open source Python library for authoring Alexa applications. We call her Lazysusan. I’ll walk you through all of the steps in authoring a very very basic Alexa Skill. I find that Python strikes a really nice balance in terms of readability, capabilities and extensibility for Lambda functions. There is an existing npm module for Alexa skills from the Amazon teams. We opted to write our own in Python for the main reason that we found Python to be a much nicer and easier language to work with. Lazysusan has one big concept which is critical to understanding how to build your own skill…that is, application state. I’ll walk through it fun little Alexa skill and explain how it’s built with Lazysusan. text: Please say what day, month and year you were born. Thanks for trying age difference, good bye. A “session” in Alexa parlance can be a bit nebulous. By default, when a user launches your skill and begins interacting it there is a built-in session which is active. This “session” is nothing more than some data sent to your Lambda function in the json payload. As long as the user is interacting with your skill and the blue light ring on top of the device is illuminated, the session is active. If the user doesn’t respond at all or reaches the “end” of the skill, the session will be killed. Think of an Alexa session as a conversation with a real person…provided you keep the conversation going, the session is active. Now imagine during a real conversation you simply walk out the door leaving your conversational partner standing there alone. Your conversation has ended and the session is now over. Or, imagine the other party in the conversation bluntly ends the chat…“I’m sorry, but I have to go. Goodbye”. This is exactly how a session may end with Alexa. You may simple decide you’re done and not reply or the other party may call it quits. So, let’s define state is in Lazysusan parlance. 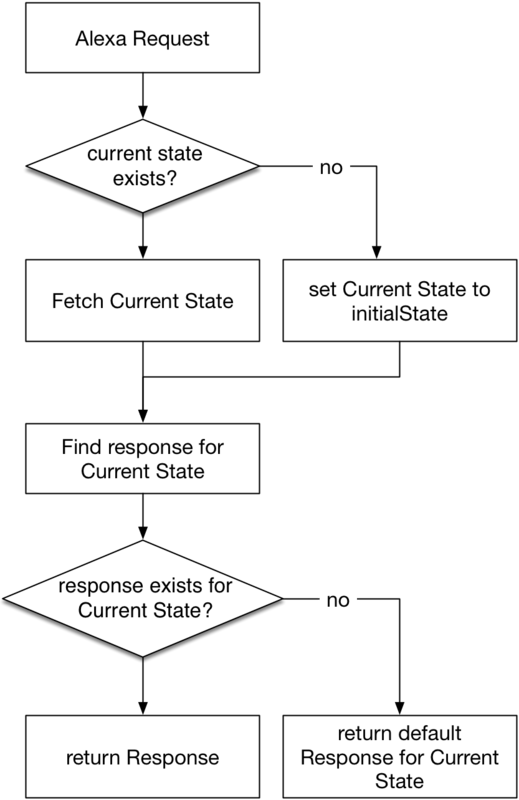 State is nothing more than a current location in your Alexa Skill “flow”. In concrete terms, “state” will simple be the name of the top-level keys in your states.yml file. In our example above there are three possible states: initialState, missingYear and goodBye. I will keep the explanation of “intent” brief since there is lots of documentation about it on the Alexa developer site. For this post it’s still important to understand it from a high level. When defining the interaction model of your Alexa Skill in the Alexa developer portal you will map natural language phrases to intents. For example, “My phone number if 555-1212” may map to something you define as MyPhoneNumberIntent. Your Alexa skill will receive a json payload that literally has the MyPhoneNumberIntent string included in it. Given you know what the user’s intent is, you can make some decisions via application code on how to respond. Of course there are many details around using and defining intents so I’d encourage you to read the Amazon docs for more information. With those to pieces of information, Lazysusan will look up the LaunchRequest key in the list of branches in the initialState block. As you can see in the yaml above, LaunchRequest simply points back to the initialState block which contains a fully valid Alexa response in yaml. Lazysusan will take this content verbatim, convert it into json and sent it back to Alexa. With those to pieces of information, Lazysusan will look up the MyAgeIntent key the list of branches in the initialState block. Looking at the branches list above we can see how Lazysusan will determine the response. This is a magical little part of the PyYAML package. Here, MyAgeIntent is literally pointing to a Python function. If Lazysusan encounters a callable object/function in states.yml it will call that function with six arguments (you can see those arguments in the app.py file). If you look at the source code for this example, we are doing a bunch of fancy date math (made harder due to leap years, of course) and returning a response with a helper function appropriately called, build_response. There are currently six kwargs which are passed into a callback from Lazysusan. Here, we really only care about three of those and get them out of the kwargs dictionary. One of the objects you have access to is a session object. In the call to session.set above we are shoving a value into the session for the DOB_KEY value. You may use the session however you see fit…it’s simply a key-value store provided for your use. It may come as no big surprise that we opted to use Serverless for managing out Lambda functions and other dependencies. This ended up being a really great choice since Serverless will manage not only your Lambda functions but anything else that is supported by CloudFormation (which is almost everything). As of this writing managing Alexa Skills isn’t nearly as easy. The only way to manage your interaction model and overall configuration is to fire up developer.amazon.com and plug things in manually. I know that Amazon is working on driving configuration of Alexa Skills programatically but it’s currently not there. Here’s a little recording of the demo skill. As you can hear, there are a lot of calculated valued returned from the user’s input. This shows the flexibility of the callback mechanism we’ve implemented. Marking a location in states.yml as not being a state to track. This is critical when receiving callbacks from Alexa during audio playback. Lazysusan makes building Alexa apps really really simple. In a future post I’ll drill into some more detail around the apis and things you may need to be aware of. We’ve developed a few example applications which can be found in the examples directory in our Github repository. These are great places to start exploring if you’d like to take Lazysusan for a spin or have a better understanding of what the application code looks like. These examples show a somewhat complex skill such as the age calculator and some others which are driven almost exclusively from the states.yml file with very very little Python code.